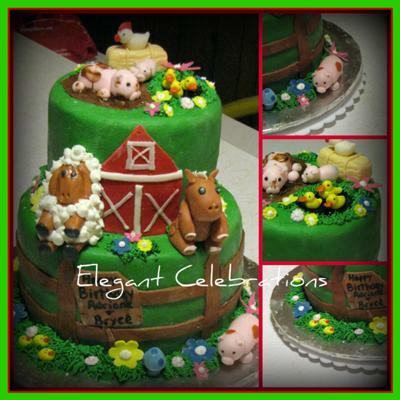 For this farm cake, I made a ten inch round white cake and a 6 inch round chocolate cake. The white cake had vanilla buttercream frosting and the chocolate had chocolate frosting. Both cakes were covered in green colored fondant. I made several different colors of fondant and gumpaste. I rolled out my gumpaste and cut out my flowers using Wilton flower cutters. For the fence I drew and cut out my fence post shapes using typing paper. After I rolled out my brown fondant I used my template and a paring knife to cut lots of fence posts. For the rails I just cut a long strip using Wilton's ribbon cutter and then cut them the length I wanted them to be. I attached the fence pieces with piping gel. I used fondant to mold my animals. Toothpicks and piping gel were used to hold the bodies, heads, and limbs together. I made impressions in the fondant where I wanted the eyes using a toothpick. I put piping gel in the holes and molded the eyes leaving a point on the back to fit into the holes left by the toothpick. The animals were attached to the cake using dowel rods. For the hay I hand molded a rectangle of fondant and used a butter knife, the flatter side to make the impressions of the hay. Then I cut out long thin strips of the same fondant and wrapped it around the hay bale to look like the ties. For the sheep I hand molded his body and head. After I attached him to the cake I piped vanilla buttercream with a tip 8 to make his wool. The mud puddle was made by making a cut out in the fondant and filling it with chocolate frosting mixed with some chocolate syrup. The pond was made by doing the same but I filled it with blue colored piping gel. The barn door was red fondant cut out using a pizza cutter. I just cut this freehand and added strips of white fondant to add the details. It was attached to the cake using piping gel. I randomly piped green buttercream frosting using Wilton's grass tip and then added the flowers and other details here and there. I used the SPS system to stack my cakes with royal icing on each plate to prevent sliding. Single Plate System is a stacking system made by Bakery crafts. It is so sturdy. Its really amazing. Really great work. Congratulations on a 1st place win! It's well deserved. ps ~ what is sps system? Join in and write your own page! It's easy to do. How? Simply click here to return to Farm or Barnyard Cake.